Calcium hypochlorite is an inorganic compound with formula Ca(ClO)2. As a mixture with lime and calcium chloride, it is marketed as chlorine powder or bleach powder for water treatment and as a bleaching agent. It strongly smells of chlorine, owing to its slow decomposition in moist air. It is not highly soluble in water and is more preferably used in soft to medium-hard water. Calcium hypochlorite is commonly used to sanitize public swimming pools and disinfect drinking water. Calcium hypochlorite is also used in kitchens to disinfect surfaces and equipment. Other common uses include bathroom cleansers, household disinfectant sprays, algaecides, herbicides, and laundry detergents. It is also used as an oxidizing agent. 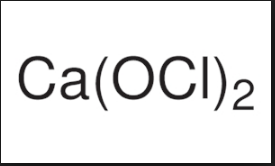 Calcium hypochlorite is produced industrially by treating lime (Ca(OH)2) with chlorine gas.